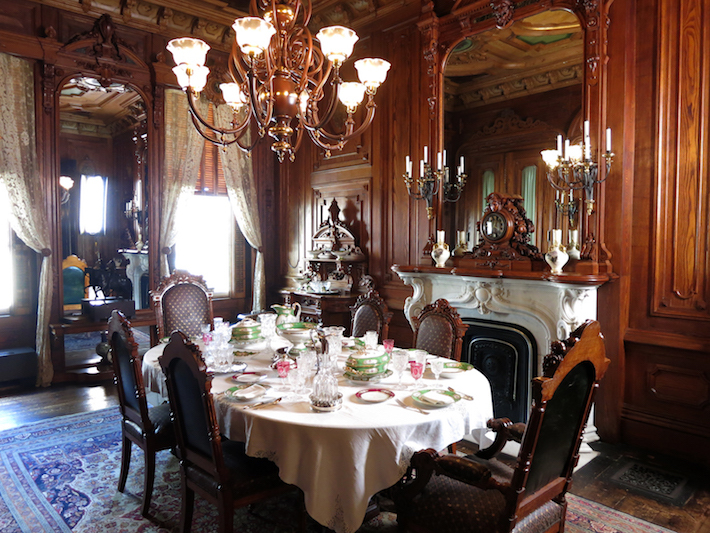 Peek inside the gilded, paneled, elaborately painted Victoria Mansion in Portland, where one early-twentieth-century family had a whole lot of fun. 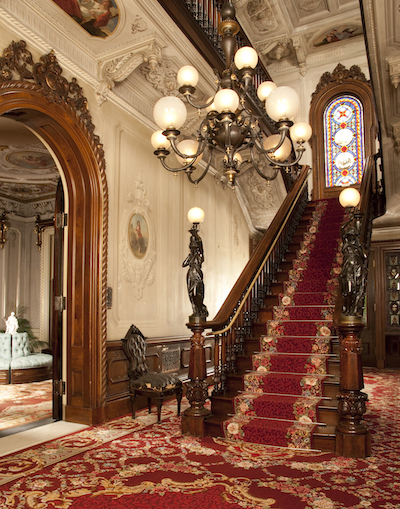 In the 1920s, Alice Willman slid down the carved walnut railings of the staircase in Portland’s palatial Victoria Mansion with her siblings and cousins. Known as a “flying” staircase because it has no visible support (not because it supported whizzing children), the floral-carpeted structure descends from a landing punctuated with an intricate, arched stained-glass window to an entrance hall resplendent with ornamental plasterwork, where Willman’s grandmother, Louisa Larrabee Libby, placed pillows behind the bronze figures on the newel posts to cushion the kids’ approach. Mary Louise Chamberlain also told tales about life in the home of her parents, Louisa and Joseph Ralph (“J.R.”) Libby, recounting details as mundane as the oatmeal they had for breakfast in the chestnut-paneled dining room, and dramatic, such as the evening the two-piece box spring her great-aunt, Sarah, had just laid down on collapsed inward, trapping the woman inside. 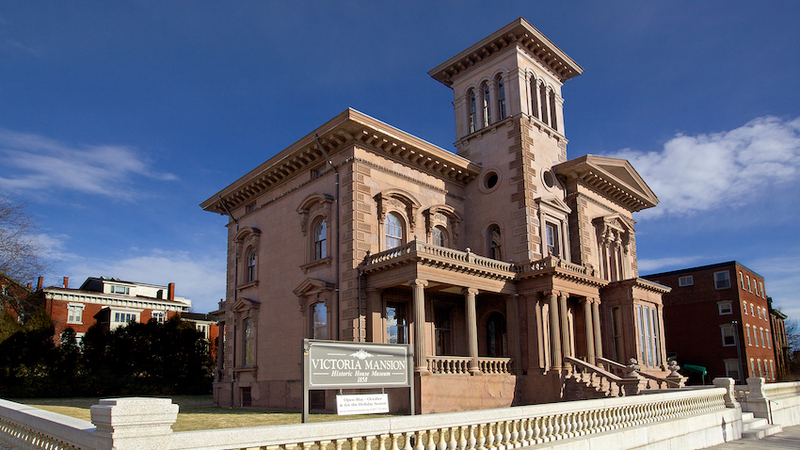 “Most people can’t imagine a family living in this house comfortably but they certainly did, and I think they all had their share of fun here,” says Thomas Johnson, executive director of the 1860 mansion, which has operated as a museum since 1941. The Libbys purchased the house fully furnished in 1894 from Olive Ring Merrill Morse, the widow of Ruggles Sylvester Morse, a successful hotelier and the driving force behind the building’s design. The Morses were Maine natives but lived most of the year in New Orleans, where Ruggles developed a taste for stained glass, frescoes, gilding, and giant mirrors, while managing some of the nation’s most luxurious hotels. 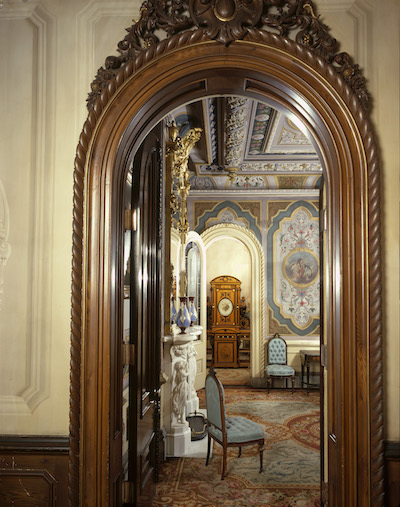 He hired prominent New York interior designer and furniture maker, Gustave Herter, to incorporate these and other decorative elements into his summer home, which was designed by New Haven architect Henry Austin in the Italian villa style. Although the genre and the mansion’s décor were no longer in fashion when the Libbys moved in, they left the home largely intact. As the owner of the former J.R. Libby Co. department store on Congress Street, “J.R. 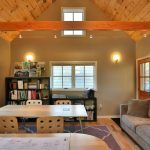 had an eye for quality and likely appreciated the workmanship in the home,” says Johnson. One element he did not approve of, however, was the Morses’ wine collection, which the teetotaler Libbys reputedly emptied shortly after they arrived. 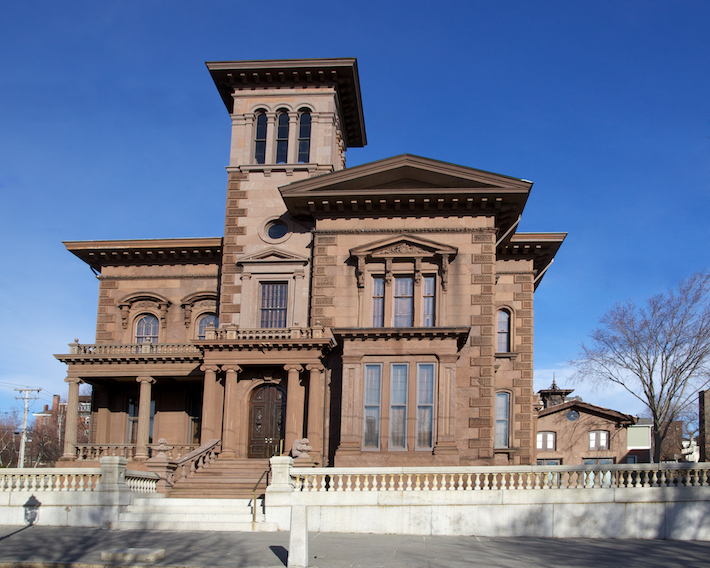 The decimated wine cellar notwithstanding, the home contains over 90 percent of its original interiors, which are open to the public from May through October. Here are some of the splendors that await. Seven months after construction began on Ruggles and Olive Morse’s summer place on Danforth Street, the Portland Transcript declared the “superb freestone mansion a perfect architectural gem, probably the most elegant and costly private residence in the State.” With its asymmetrical plan, square tower, deep cornices, and verandas, the Italian villa-style home references the architecture of Italy’s urban palazzos and Tuscan countryside, as well as Osborne House, Queen Victoria and Prince Albert’s 1845 estate on the Isle of Wight. Look for a painting that actually belonged to Victoria Mansion’s namesake queen, and depicts her country home, in the entrance hall. The mansion’s somber brownstone exterior gives way to a riot of color inside, as well as the largest collection of furnishings from renowned nineteenth-century designer Gustave Herter’s workshop in the United States. In the entrance hall, the walnut railings the grandchildren of second owners J.R. and Louisa Libby slid down are set off with bronze standards in the shape of Grecian maidens on the newel posts. A two-tier gasolier, suspended from the third floor, illuminates the room’s decorative plasterwork, carved and gilt wood brackets, frescoes, wood-grain-painted paneling, and canvas paintings in trompe l’oeil frames. Guests were escorted into a reception room off the entrance hall embellished with trompe l’oeil panels containing leafy scrolls and fanciful paintings of cherubs, molded plaster borders of painted flowers and ribbon-bound fruit, a carved marble fireplace, chenille Axminster carpet, and upholstered rosewood seating crafted by Herter. A lavishly detailed figured maple and rosewood cabinet, also by Herter, commands the adjoining chamber. The designer and Italian scenic artist Giuseppe Guidicini, who is responsible for all the surface painting in the home, completed the interiors in just four months. On Thanksgiving in 1916, the Libbys entertained 18 family members at the expanding table in the chestnut-paneled dining room, shown here with the Morses’ monogrammed French porcelain china, glassware, and silver. Elaborately carved built-in oak mirrors and buffets ornament the walls. Overhead, oil paintings of food imagery intersperse a trompe l’oeil ceiling that replicates woodwork. From the parlor, the homeowners and their friends could step through windows fitted with sliding plate-glass pocket doors to a pair of verandas situated at either end of the massive space. Two ceiling paintings portraying love scenes from Homer’s Iliad establish the room’s theme, which is reinforced by gilt bronze cupids on the gasolier, and winged children painted on the walls and carved into Herter’s rosewood table and upholstered seating. 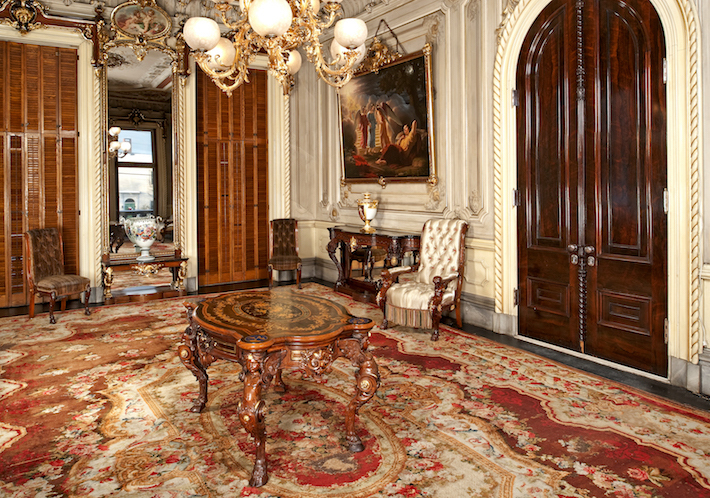 Images of roses and shells — emblems of Venus, the goddess of love — also abound in the parlor’s paintings, furniture, and Templeton carpet. 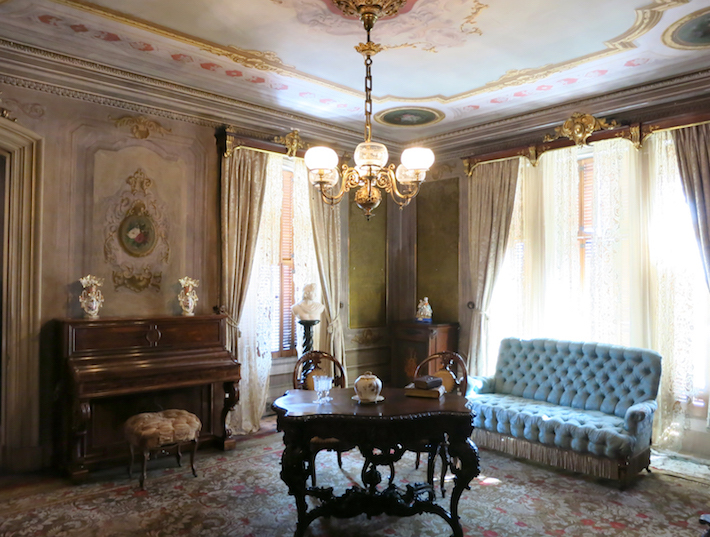 With its pale-mauve walls and ceiling painted with panels of gold, vine-patterned faux damask and rose bouquets, the upstairs sitting room has a feminine sensibility and is likely where Olive Morse read, sewed, played the piano and entertained guests. In the Libbys’ day, the family gathered here in the evenings with the doors closed to keep out drafts — which is why they did not immediately hear Aunt Sarah’s cries for help the night she became pinned inside a folded-up box spring. 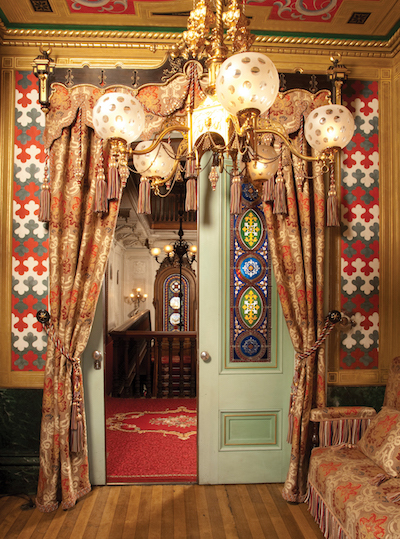 The earliest known Islamic-style interior in the United States, the mansion’s Turkish smoking room takes its design cues from the country where the best tobacco was believed to originate. Herter incorporated a dazzling array of arabesque and trefoil designs rendered in a complementary red and green palette accented with gold. After the Libbys converted the chamber into a bedroom for Louisa’s mother, Mary Thaxter Larrabee, the museum restored it to its former glory with meticulously reproduced silk and wool curtains, valances, and upholstery trimmed with fringe and 82 hand-tied tassels made in Paris.